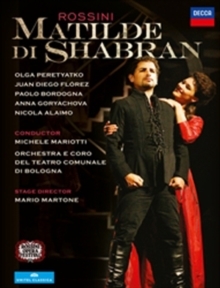 Juan Diego Flórez takes on the lead role in this performance of Rossini's opera at the 2012 Pesaro Festival. Corradino (Flórez), a paranoid, misogynistic lord, is in the care of Aliprando (Nicola Alaimo), a doctor who is concerned that the poor spirits of his employer will damage his health. He duly attempts to make Corradino fall in love with the beautiful and self-willed Matilde (Olga Peretyatko).